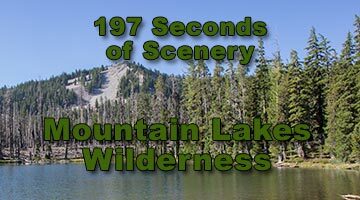 Mountain Lakes Wilderness - Oregon Cascades - Explore! 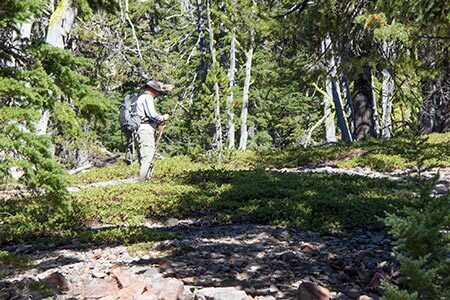 Mountain Lakes Wilderness - Oregon Cascades - Explore! 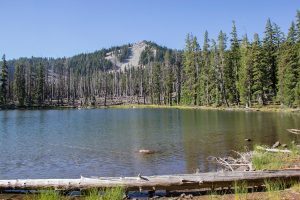 The Mountain Lakes Wilderness was designated a Primitive Area by the U.S. Forest Service in 1930. 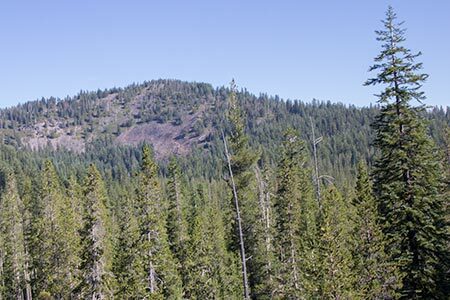 It is just northwest of Klamath Falls, Oregon, on the Winema National Forest. In 1940 the area was expanded and designated a Wild Area. It has a square shape because its boundaries follow a single township in the U.S. Public Land Survey System. The township is a six by six mile square and thus comprises 36 square miles. It’s official acreage is 23,071, rather than 23,040, reflecting deviations often found in the public land survey. Coincidentally, the township happened to encompass most of the remains of several ancient volcanoes. The area was designated an official Wilderness on September 3, 1964 with the signing of the Wilderness Act of 1964. That act created the Wilderness system in the United States. The mountains in this area began forming about seven million years ago. 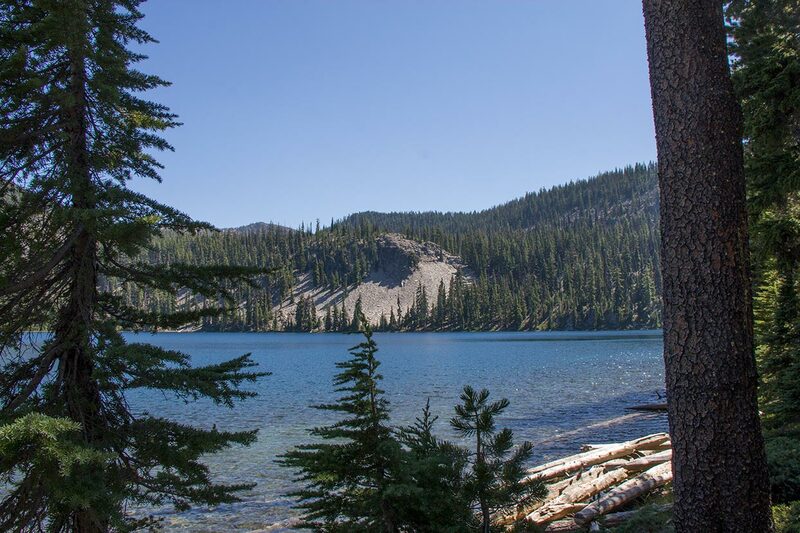 According to the U.S. Geological Survey1 the oldest rocks found in the Mountain Lakes Wilderness were about 3.6 million years old. 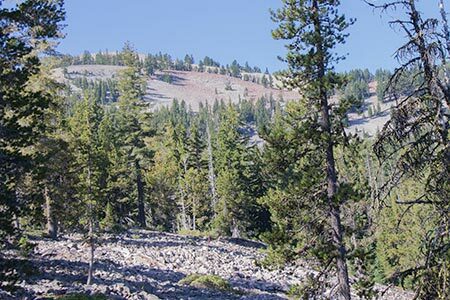 USGS reports that none of the mountains in the immediate area are less than 500,000 years old. More recently, ice sheets repeatedly covered the crest of the mountains to a depth of several hundred feet. 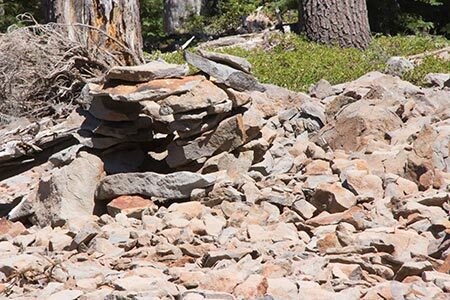 Glaciers moved down the mountains to the east and northeast as far as Upper Klamath Lake. According to a Forest Service publication2, there was a single 12,000 foot mountain here that exploded and formed a caldera in a process similar to Crater Lake. However, that explosion was followed by glaciation that carved the caldera into the landform we see today. 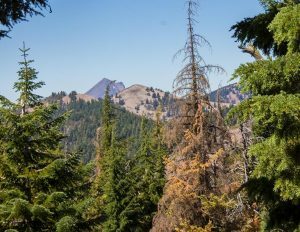 Another publication3, suggests that four overlapping shield volcanoes, the tallest being Aspen Butte at 8,208 feet, were simply carved by glaciers into the form we see today. The other volcanoes are Mount Harriman (7,979 feet), Crater Mountain (7,785 feet) and Greylock Mountain (7,741 feet). 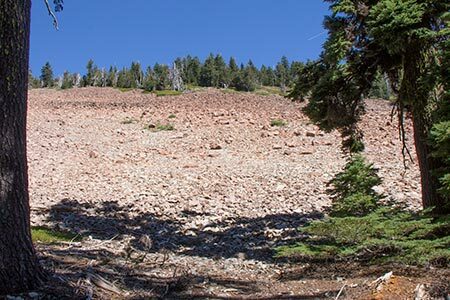 Another peak, Mount Carmine (7,882 feet), is reported to be the highest remnant of the north flank of the Aspen Butte volcano separated from it by two glacial cirques. 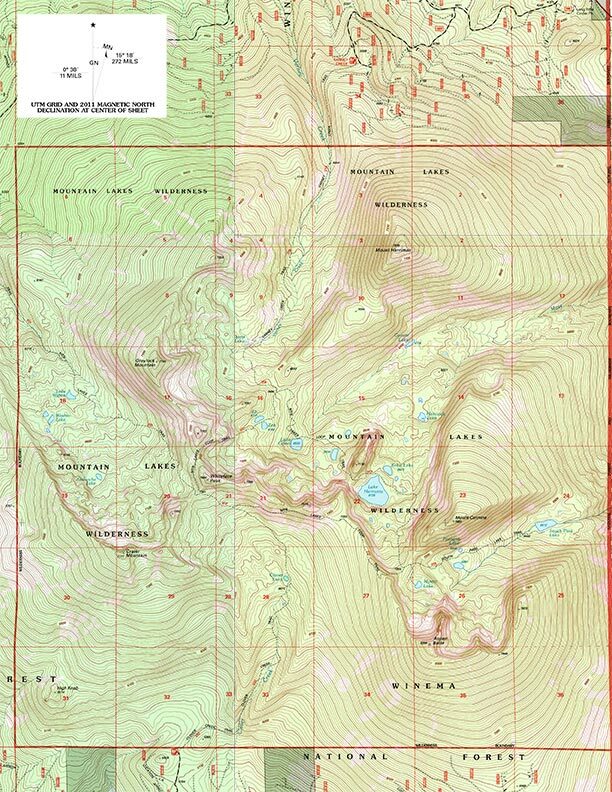 Mount Harriman seems to me to be an anomaly. The lower part of its western and southern flanks look like they were carved by glaciers moving down from the other mountains, but there is little evidence of glaciation on the northeast face of its peak where alpine glaciers usually formed in this region. It could be that it was in the rain shadow of the larger mountains and a significant glacier did not form on it. 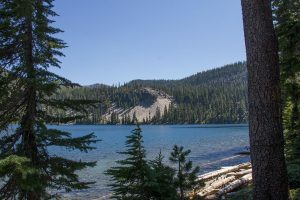 Mountain Lakes Trail extends 6.3 miles from a trailhead on Forest Road 3660 south of Highway 140 and east of Dead Indian Memorial Highway to the Mountain Lakes Loop Trail within the Wilderness. From Klamath Falls, Oregon, take Oregon Highway 140 west toward Medford, Oregon, for about 31 miles and then turn left onto Dead Indian Memorial Road. From Dead Indian Memorial Road, turn left onto Forest Service Road 3610 and then right onto FS Road 3660 to the trailhead. 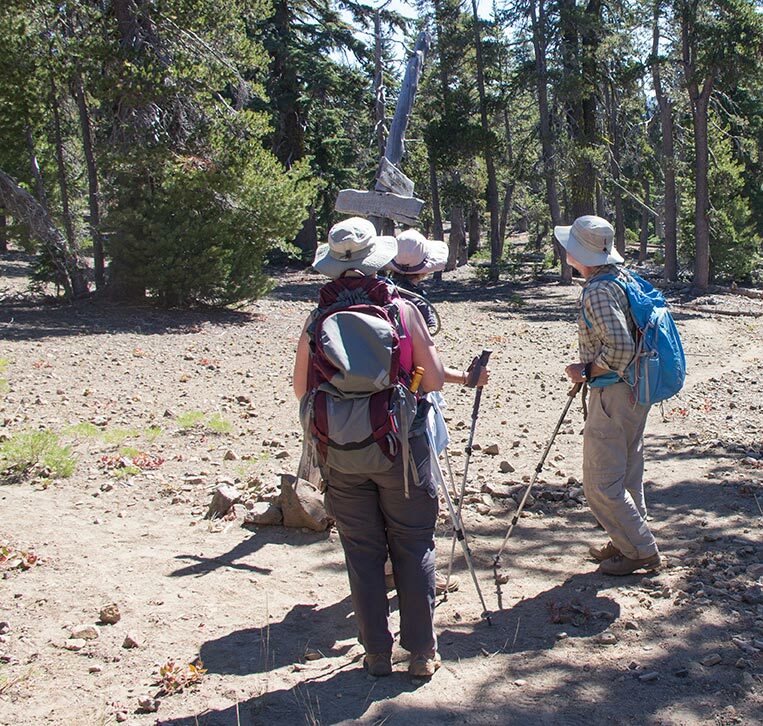 Clover Creek Trail extends 4.3 miles from a trailhead south of the Wilderness to the Mountain Lakes Loop Trail. From Klamath Falls, Oregon, take Oregon Highway 66 west towards Keno, Oregon, for approximately eight miles and then turn right onto Clover Creek Road. From Clover Creek Road, turn right onto FS Road 3852. The Clover Creek Trailhead is at the end of FS Road 3852. 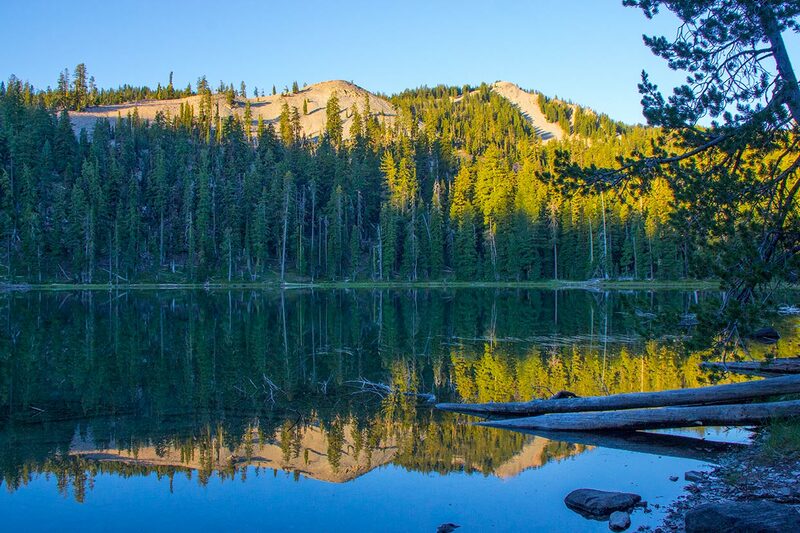 Varney Creek Trail extends 4.4 miles from a trailhead north of the Wilderness to the Mountain Lakes Loop Trail. From Klamath Falls, Oregon, take Oregon Highway 140 west toward Medford, Oregon, and turn left onto Forest Service (FS) Road 3637 (Varney Creek Sign) then take another left onto FS Road 3664. The trailhead is at the end of the road. 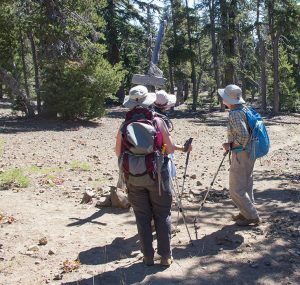 This adventure was a two night backpacking trip with the Klamath Basin Outdoor Group. We accessed the Wilderness on the Varney Creek Trail. 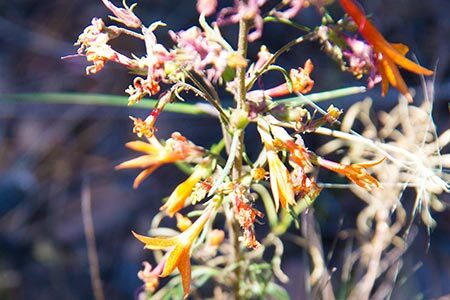 This trip took place in late August 2016 after the famous mosquitoes had dispersed. In fact, I only saw two mosquitoes on the entire trip. One in our party put their tent near a large hornet’s nest (discovered later), but the hornets didn’t seem to be much concerned about the intrusion. Varney Creek Trail begins at the trailhead mentioned above at about 5,600 feet elevation and climbs over 4.4 miles to reach the Mountain Lakes Loop Trail at 6690 feet elevation. 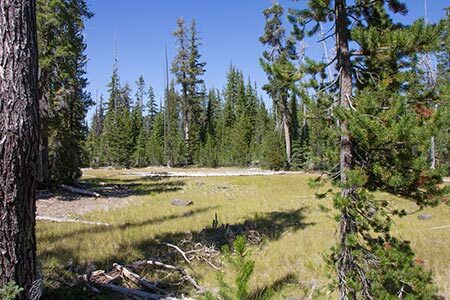 The trail crosses to the west of Varney Creek on a small bridge, enters the Wilderness after about a mile, parallels Varney Creek to a point near Storm Lake then heads southeast to the Mountain Lakes Loop Trail. We followed the loop trail east and south, downhill, about 0.6 miles to Lake Como. There were a few tress that had blown down across the trail, but all were easy to climb over or bypass. Our group got fairly spread out on the climb. Two of our party came across a black bear that impressed them wth its rapid retreat. Other than that, the only notable wildlife was a good sized garter snake along the shore of Lake Como. After setting up camp at Lake Come we relaxed and explored the immediate area. 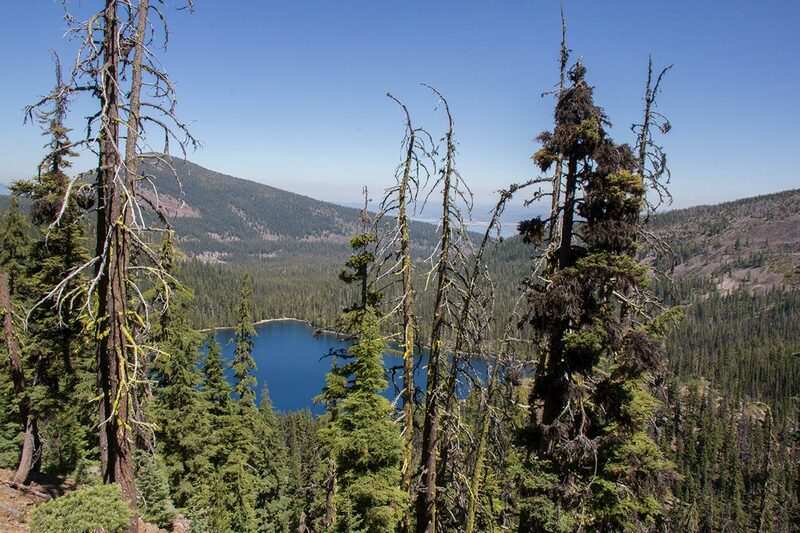 As the name implies, the Mountain Lakes Loop Trail offers a loop around the Wilderness Area. We took the 8.5 mile trail counter-clockwise from Lake Como so as to climb the steepest portion while well rested. The first highlights of the trail are Zeb and Eb Lakes. The trail passes between the two. Both are small and shallow. Nice campsites could be found on their perimeters and swimming is always a possibility. Some report catching brook and rainbow trout and largemouth bass in Zeb Lake. 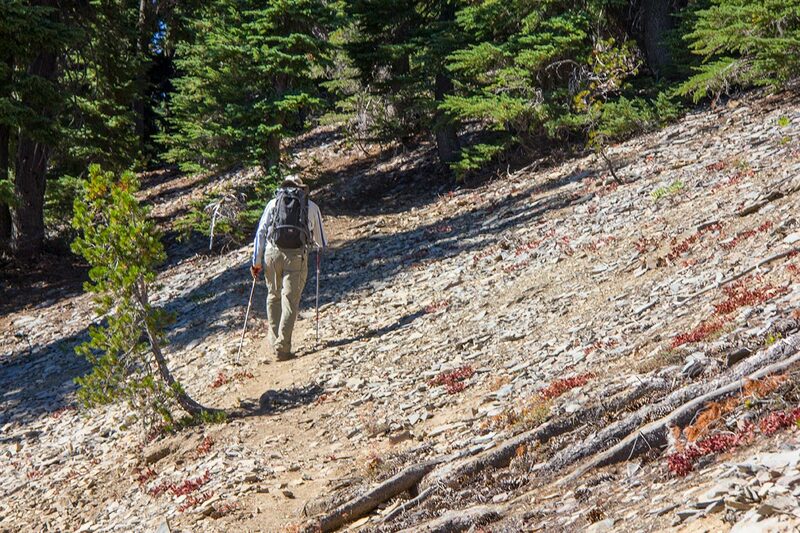 About a quarter mile past the twin lakes, the trail begins to climb the ridge with several switchbacks. We slowly climbed 400 feet in a quarter mile. As we climbed, the views back toward Lake Como became more and more impressive and we got close-up views of the talus slopes of the unnamed 7,703 foot peak just north of Whiteface Peak. We took a well-deserved break at the saddle between the two peaks. From the saddle, the trail is fairly level as it circles around the west side of Whiteface Peak. Then it descends a couple of hundred feet to the point where the Mountain Lakes Trail joins the loop trail. The signing at this intersection illustrates the importance of knowing your route beforehand. The three hikers had three interpretations as to the meaning of the signs. 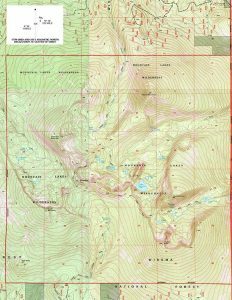 Fortunately we had maps with us and had studied them beforehand so we knew the correct trail to take – the trail starting downhill behind the blue backpack. There were only a couple of trees across the trail in this section and they were easy to bypass. From the intersection, the trail dropped a little then we began a steady climb back up the two hundred feet that we had just descended. After a short level section the trail began climbing along the edge of the ridge and up the flank of Aspen Butte. There were some outstanding views from the ridge including the view seen in the header photo at the top of this page showing Lake Harrietta with Mount Harriman in the background. We also caught a quick glimpse of Mount McLoughlin as seen in the photo to the right. Upon reaching about 7550 feet in elevation, we dropped off the ridge and back down into the caldera. Shortly after starting down, we came upon a huge log across the trail. Given the steepness of the terrain, there was no reasonable way to get around it, so we carefully climbed over, all the while hoping the log wouldn’t decide to continue its journey down the mountain with one of us astride it. The switchbacks down the mountain offered nice views through the open forest, but nothing in the way of distant landscapes. 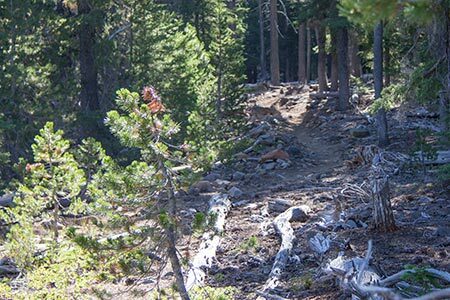 Upon reaching the intersection with the South Pass Lake Trail we learned that this portion of the loop is favored by equestrians. They had come in on the Varney Creek Trail and followed the Mountain Lakes Loop Trail clockwise apparently headed toward Mystic Lake or South Pass Lake. 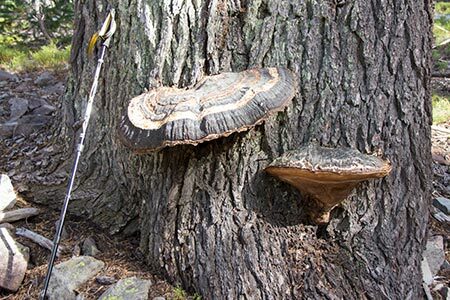 While it’s an added chore to be looking for and stepping around horse apples, I am thankful for the great work that the equestrian groups do by bringing in saws and removing down trees from trails in the area. 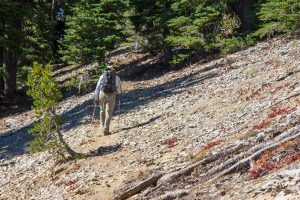 The trail continues to drop down to and around Lake Harriette before it climbs back 100 feet or so to get out of the Harriette basin. From there it is all downhill back to Lake Como passing a couple of tiny lakes that were barely visible through the trees. We spent the night at our camp on Lake Como. The next morning we hiked out the Varney Creek Trail to the trailhead. You can see more photos taken along the trails below, but first, lets take a look at our video. The video includes a short shot of an opening along the Varney Creek Trail, panoramas of Lake Como, from the top of the ridge overlooking Lake Harriette and at Lake Harriette. 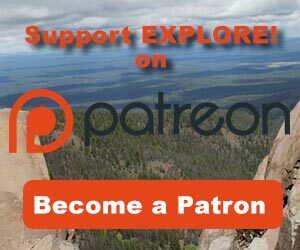 I’ve also included a clip to illustrate hiking on the trail heading toward Lake Harriette from Aspen Butte. For a larger version of the video, see our YouTube channel. 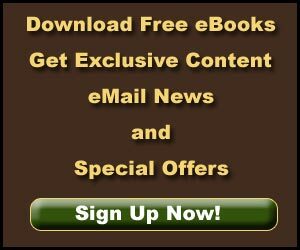 Unless otherwise noted, the text, photos and video were developed by Jerry Haugen, your pathfinder, and ©2016 Global Creations LLC, All Rights Reserved. 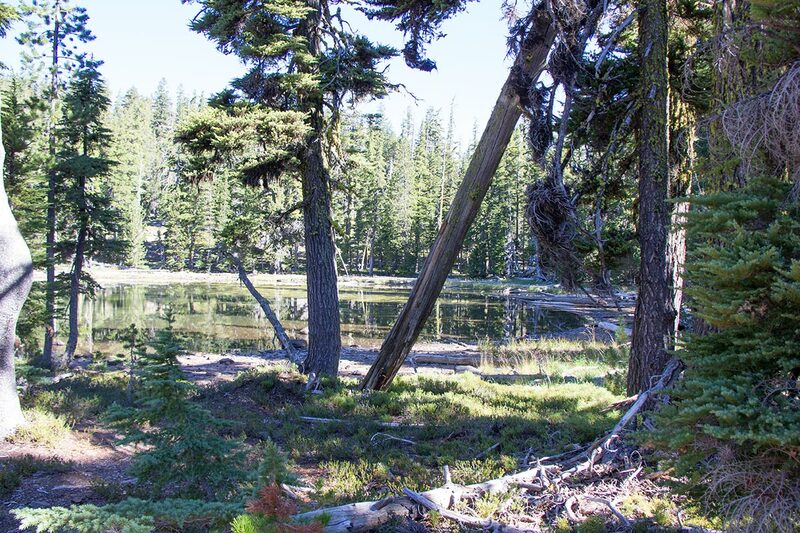 James G. Smith, Benham, John R. and Johnson, Frederick L. Mineral Resource Potential of the Sky Lakes Roadless Area and Mountain Lakes Wilderness, Jackson and Klamath Counties, Oregon – Summary Report. Carver, Gary Allen (1972). 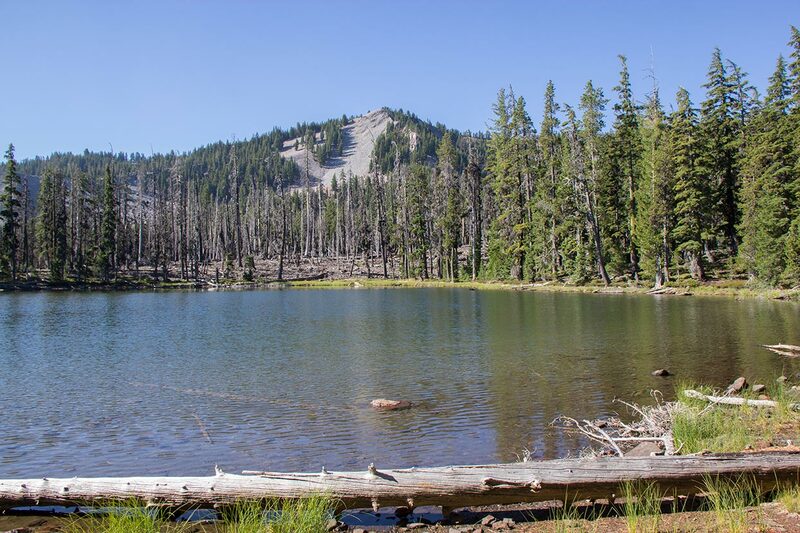 Glacial Geology of the Mountain Lakes Wilderness and Adjacent Parts of the Cascade Range Oregon. Ph.D. dissertation, University of Washington.